or a control panel with user-defined buttons, switches, displays, entry fields, and spreadsheet lists (Zorro S or executable strategies only). A panel can have a virtually unlimited number of rows and columns. If there are more than fit on the screen, the panel can be scrolled with scrollbars on the right and bottom side. Header rows or columns can be defined that stay fixed when the rest of the panel scrolls. 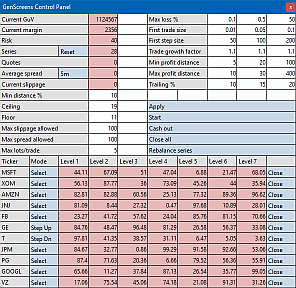 This way, individual asset parameters can be set up or displayed for multi-asset strategies. An example of a scrolling panel with thousands of rows can be found in the History.c script. Opens an empty control panel with the given number of rows and columns, background color, and horizontal cell size in pixels. If a control panel was already open, it is replaced by the new one. The panel is opened next to the Zorro window, and can be freely moved by dragging it with the mouse. If the number of rows or columns exceed the screen size, scrollbars are added to the panel. panel(0,0,0) removes the panel. Set properties or update content of an individual cell. row - row number starting with 0, or -1 for the [Result] button, or -2 for the [Action] scrollbox. col - column number starting with 0, or line number in the [Action] scrollbox. text - content to appear in the cell, button, or scrollbox line, or 0 for not changing the content. Numbers can be converted to text with strf. color - background color of the cell, or 0 for not changing the color. Default colors are stored in ColorPanel[n], where n = 0 for text background, 1 for number background, 2 for an editable field, 3 for a button, 4 for highlighted text, 5 for grayed out text. style - 1 normal cell, 2 red highlighted text, 3 greyed-out text, 4 right-aligned, 8 left-aligned, 12 centered, 0 for not changing the style. type - 1 normal cell, 2 editable cell, 4 button, 0 for not changing the type. If type is nonzero, the entry is selected in the [Action] scrollbox. Returns a temporary string with the current content of the cell. Numbers can be converted from the returned string with sscanf, atof, or atoi. Merges the given area of the panel to a single cell, with the content of the first cell. Row / Col is the upper left corner and NumRows / NumCols the size. Gives the number of header rows and columns that stay fixed on a scrolling panel. Saves the panel content in .csv format to the given FileName, or to "Data\*.pan" when the name is empty or zero. Loads the saved panel content in .csv format from the given FileName, or from "Data\*.pan" when the name is empty or zero. Only editable or button cells are affected. - selecting a previously set action from the [Action] scrollbox (Row = -2). - selecting an asset with the [Asset] scrollbox (Row = -3; asset name in AssetBox). Dependent on the desired behavior of the button, the function can then change the cell color or content through panelSet, and/or save the panel content with panelSave(). Control panels can only be created with Zorro S, but can be included in executable strategies (.x files) and can then also be used with the free Zorro version. Even without a panel, the [Result] button or the [Asset] scrollbox can trigger the click function. Text on the panel caption bar can be displayed with the print(TO_PANEL,...) function. The panel stays open after the end of the strategy unless it is explicitely removed either with panel(0,0,0,0), or by clicking [Edit], or by selecting a new script. As long as it is open, it can still be edited and can even trigger functions when clicked on. For preventing that functions are triggered when the script is not running, check the RUNNING flag. For keeping the previous panel content when the strategy is restarted, call panel() or panelLoad() only when both the INITRUN and the CHANGED flags are set. The [Action] scrollbox keeps its state after the end of the strategy unless it is explicitely removed either with panel(0,0,0,0) or by selecting a new script. The selection state of the scrollbox can be saved in an AlgoVar and restored at the start of the strategy. if(Text == "Buy") // toggle button between "Buy" and "Sell"